I installed Ubuntu alongside Windows 7 and everything worked well. But a problem arose where I had to reinstall Windows 7 so I did. But after the install, I am no longer able to boot into Ubuntu, there is no screen that allows any options, it loads directly into Windows 7. Any solutions to solving this without having to re-install Ubuntu? When I re-installed Windows 7, I was cautious enough to not install it accidentally on the Ubuntu partition and only install it on the Windows partition. The Ubuntu partitions and swap area is still there so I believe I haven't lost anything, I'm just unable to boot into Ubuntu. If you have a Ubuntu Live CD , then start Live session . 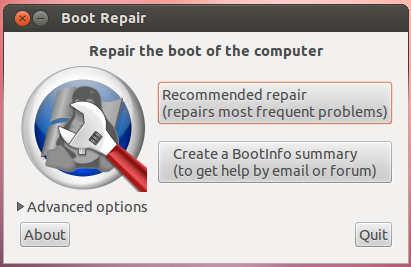 then it will open boot-repair as shown in image there select Recommended Repair Option . It will do the job of restoring your GRUB and then give a restart . remove your CD . There you go with your GRUB . The easiest way to resolve this problem is to boot your computer from a live Ubuntu CD or USB then install and run Boot Repair to reinstall grub and recover access to Ubuntu. Have a look a the following link for instructions on installing and using boot repair. Not the answer you're looking for? Browse other questions tagged 12.04 dual-boot or ask your own question. How can I get GRUB to appear after installing Ubuntu with Windows 7 using a LiveUSB? How do I boot into Ubuntu (after installing, it still just boots to Windows)?